This volume explores the issues and debates surrounding the ongoing processes of democratization in sub-Saharan Africa, illuminating the central dynamics characterizing Africa’s democratic experiments, and considering the connections between democratization and economic, social, and cultural developments on the continent. Chapters offer overviews of the key scholarship on particular topics, including central insights from the latest research, and provide suggestions for those interested in further inquiry. The material includes attention to broad cross-continental patterns, for example with respect to public opinion, political violence, or the role of different institutions and actors. It also includes rich case material, drawing on and highlighting the experiences of a diverse collection of countries. 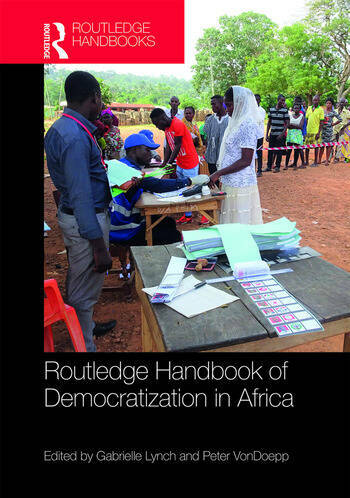 Encouraging a comprehensive view of key concerns and enhancing understanding of particular issues, the Handbook of Democratization in Africa represents a critical resource for experts and students of African politics, democratization, and African studies. Gabrielle Lynch is Professor of Comparative Politics at the University of Warwick, UK. Peter VonDoepp is Associate Professor of Political Science at the University of Vermont, USA.